Paperweightswere first made in Europe, probably in Venice in the late 15th century. Some of the earliest surviving examples were made in France from about 1750 onwards and in England from the early 1800&apos;s using sulphides (ceramic cameos) as the centrepiece in a ball of clear glass. The Venetians revived the Roman millefiori (thousand flowers) techniqe of creating a design within a rod ofglass. This was done by clustering together rods of different colours to form a design and then fusing these rods into one, pulling it out to make one long thin rod, and cutting it into sections. These sections were (and still are) cut into slices each slice with the same cross-sectional design (often a flower, sometimes a figure or a letter or date). To make a millefiori paperweight, these slices of cane were put together to form a pattern which was picked up on a ball of molten glass and then shaped to form the paperweight. The resulting millefiori paperweight usually had a layer of canes with a dome of perfectly clear crystal glass over the top completely encasing the coloured sections. The Venetians exhibited this kind of paperweight at the Austrian Industry Exhibition in 1845. The French and the Bohemians had been developing similar ideas at about the same time. The period from 1840 to 1860 is often referred to as the Classical Period of paperweight production. This was the time when the great French glassworks at Clichy, Baccarat, and St. Louis led the world with the quality and creativity of their paperweights. Other countries followed their lead, and in the USA two major paperweight manufacturers were the New England Glass Company and the Boston and Sandwich Glass Company. Another important technique of making paperweights is by creating flowers, fish, animals, insects, etc. using lampworking techniques, and encasing these miniature items in a globe of glass, so creating a little artificial world trapped in a ball of glass. Today&apos;s contemporarycrystal paperweightmakers are producing some truly stunning creations, rivaling anything ever produced in the world. There are miniature botanical fantasy worlds from Paul Stankard; diatreta masterpieces by Barry Sautner; beautiful bouquets in glass from Victor Trabucco; Rick Ayotte&apos;s bird and flower scenes; Peter Raos&apos;s marine and floral scenes from New Zealand; to mention just a few of the master glassmakers. There are also studios and glassworks all around the world producing magnificent paperweights designed by artists and made by teams of glass workers. The great Baccarat glassworks in France, their rivals over many centuries, St Louis; several major USA studios, and from Scotland, J Glass, Perthshire Paperweights, and Caithness glass produce a steady flow of beautiful paperweights. 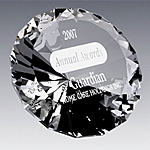 Collectors often ask what they should look for when buying paperweights. Beauty and desirability should come first, since there is little point in a paperweight collection you do not enjoy! But there are some technical flaws you should seek to avoid. The design itself should look perfect, not broken nor distorted nor off-centre. The glass dome should be sparklingly clear, and have no bubbles, specks, or flow lines in the glass. 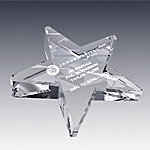 Recently,crystal and glass paperweightshave became a top selling promotional item. They are perceived as a high value corporate gift, and are also practical. Paperweights are given to commemorate a business milestone such as; accomplishment of a project, establishment of a partnership, or business anniversary. In addition, paperweights are often used in launching and reinforcing name brands. 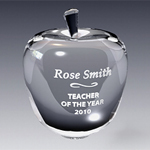 Here at Crystal Art USA, we offer a great variety of unique paperweight designs. Ourcrystal paperweightsare packaged in attractive presentation boxes and make impressive corporate gifts. 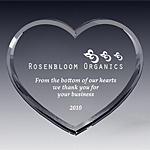 We encourage customer to personalize paperweights with their logo and/or special messages.